It's hard to believe that my oldest son, J, will be turning five next month and starting Kindergarten! That means I have been busy prepping him for the routine of school and getting his school supplies labeled and in order. Thankfully, I See Me sent us some personalized gear, including a new personalized lunch box, to help with J's big transition. It will also be a transition period for my youngest, K. He will have to adjust to having his big brother (and best friend!) spending a few days a week at school. And okay, it's going to be a transition for me too. My baby is going to school! How did that happen?! Perhaps you're in the same boat as me? 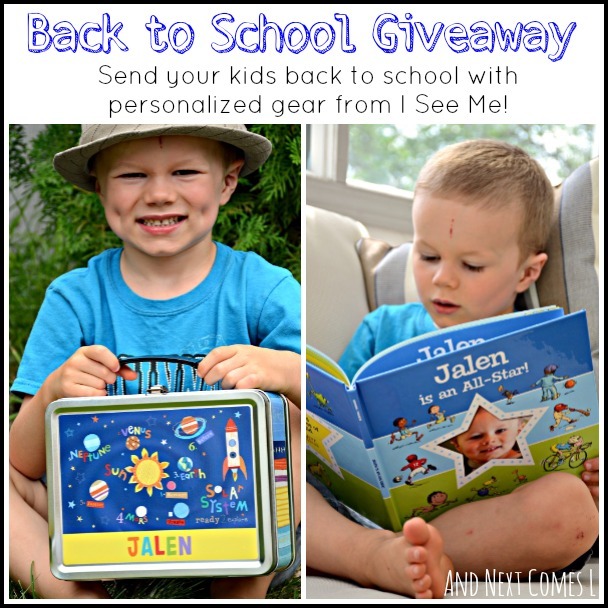 Well, I'll help ease the pain with an awesome back to school giveaway prize pack. It's worth $75! Then you and I can go cry in the corner about our babies growing up. I received the products shown from I See Me in exchange for a honest review. All opinions expressed are my own and were not influenced by the free product. J was very excited to pick out a lunch box for school. He picked the Outer Space Personalized Lunch Box and he was mighty proud to show it off! The outer space design is adorable, vibrant, and colorful. Inside, the lunch box is huge and has a chalkboard to write personalized messages. The chalkboard easily wipes clean with no chalk residue left behind. The interior has room for so much food and snacks. Good thing because J's a pretty big eater. One other thing that I loved about this lunch box was that it is really easy to open. Some metal lunch boxes can be tricky to open, but J can easily open this one on his own. So it's a perfect lunch box for little ones to eat independently at home. Getting a good breakfast before school is very important too! We were given a placemat for each of my boys. J again choose the space theme with this Outer Space Personalized Placemat. K chose the Dino-Mite Personalized Placemat. Both designs are super cute. I really like the artsy dinosaurs. I also like that both placemats label the items. So all the dinosaurs and planets have their proper name, which means my kids can learn while they eat. Cheesy, but true. J likes to name all the planets in order thanks to his placemat. We also received a personalized storybook for each of my boys. Each story book is personalized with the child's name throughout the story. Not only in the text, but on items in the illustrations too! You can even personalize the dedication page with your child's name, birth date, and a special message like "Love always, mom & dad." My boys love that their birthdays are in the book. Even two year old K has been telling everyone he meets when his birthday is! J received an I'm an All Star personalized story book, which was the perfect book for him. He has been all about winning everything and K losing. He is really not a good sport! So this story ended up having a perfect lesson just for him! The story has great tips on how to be a good sport and every two page spread has a picture of J's face, which I loved! I also loved that it had a picture of him on the front cover. This book also lets you pick five sports to feature so we picked sports that J was interested in. The I'm an All Star personalized story book also comes in a pink book with a female character. K turns three next month so he's well on his way to becoming a big boy. His story book was the I'm a Big Boy Now! personalized story book. There is no picture of K on the front. Instead, it is on the dedication page alongside his birth date. K loves, loves, LOVES his book. I think we have read it fifty billion times since it arrived on our doorstep. He is obsessed with it! The story itself is really cute and the illustrations are totally adorable. You can even customize the skin and hair color of the child in the book. Perhaps the best part about this book is all of the personalized details. Check out this two page spread. K's name is plastered everywhere. Even on the piggy bank! Clearly, we are a big fan of all the I See Me personalized gear that we received. There are so many other wonderful personalized products that they offer from board books to puzzles to stickers. They even have a new farm series that looks totally adorable! But the number one reason I fell in love with their products is simple. My name is Dyan. I have never had anything personalized ever. I remember wanting to find my name on anything at souvenir shops. I knew my kids would have similar problems because of their unique names, but with I See Me products, it's possible! My son would love the big boy now book and the cars and vehicles lunch box! He sure loves those vehicles, doesn't he?! Good luck! Good choices! Thanks for entering. Love the personalized story My Very Own Name! That looks like a super cute book too! Sounds like your son has similar interests to my youngest K! Good luck! Would be awesome for pre-school as well. I LOVE LOVE LOVE the chalkboard idea! It definitely would be great for preschool too! The chalkboard is awesome, isn't it?! I love the "Who Loves Me?" book! It's such a great idea to remind my dd of all our family since they live far away! Very good point! We have lots of relatives across Canada so my brothers, for instance, see my boys maybe once a year. A book would be a great way to remind my boys of their uncles! Agree 100%! Hard to pick a favorite, eh? I love the fairy tale book, my daughter would love it! Well maybe you will win a copy for her! Good luck! My little guy would like the 1-2-3 Blast Off With Me book and the space lunch kit! Good choices! The space design is so fun! I like the All-A-Flutter-Butterflies lunchbox..
Ha! Glad to see someone is reading all the fine print!! You are awesome, Jo! Thanks for entering. I want the Dino-Mite lunch pail! It's super cute, isn't it?! The World adventure book and the Dino-mite lunch box. Thank you for entering! I bet Nico would love those choices. It would be absolutely perfect for Addie! She's going to make a great big sister to your new baby and will of course always be a great sister to Marlow. I like the all a flutter lunchbox. It's a cute design, isn't it?! Good luck! Maybe you'll win it! Thanks for entering. E would love the fairy lunchbox and My Very Own Fairytale book! These are great girft ideas to give family for the holidays! They are wonderful gift ideas for the family! E is really into fairies lately, eh? Great choices! Thanks for entering. That's one of their new books. It look's great, doesn't it?! The lunch kit looks like so much fun! It's a great lunch box isn't it?! These books are so cute! I have been meaning to try them out with my kids. They are perfect for keepsakes. My kids really like the Pirate book and the vehicles lunchbox. Your kids would love them, Kristan! Good luck! I have 3 children, 2 of which are school age and would love these items. We have the same problem as you Dyan, we can never find the spelling of our names. These would be awesome. Downside to having unique names, eh?! Well, thanks for entering. Hope you can win for your kiddos! My little one would like the cars and vehicles themed lunchbox and book or the farm themed one. They are both cute. The farm one is new! It looks totally adorable! Well I think you already know that I'm a fan of that one! Good luck! I'd like My Very Own Fairy Tale Storybook & Lunchbox for my daughter. Good picks! Thanks for entering. I like the outerspace lunch box! I think my daughter will love the butterflies lunchbox and VIP preschooler book.thanks for the chance . It's super cute! You'll love it. Thanks for entering. Yay I got in at the last minute! G would love the same one J got but the back to school one is so cute too lol. Thanks for the great giveaway, you ROCK! !